The social commerce buzz this week? Pinterest has announced that Buyable Pins are coming later this month, launching with select retailers. 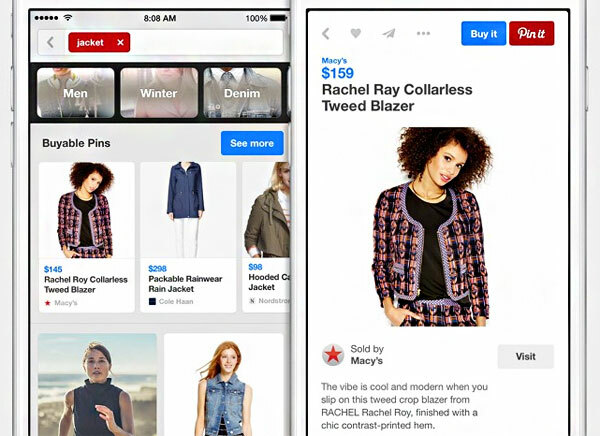 Unlike Twitter and Facebook’s respective Buy Buttons, pinners will be able to purchase without leaving Pinterest and redirecting to a retailer’s website. Instead, Pinterest’s API taps directly into retailer’s ecommerce systems to pull stock availability and pricing information, making rich pins richer (and retailers too). Buyable pins that are in-stock from an online retailer will be indicated by a blue “Buy it” button – an excellent feature considering pinned images (especially for seasonal fashion items) often survive far longer on the social platform than in retailers’ stock rooms. Pinterest users will be able to filter search and category results by what’s “buyable,” with real-time inventory and pricing to ensure no unwanted surprises. The announcement is hot on the heels of a rumor (now confirmed) that Google will add buy buttons to mobile search. Google, Facebook and Twitter all believe that purchase decisions can be made without viewing a product page. Merchandising beyond the storefront is a mobile and social reality, and the puck is moving towards online shopping happening directly through Instagram, Pinterest, Facebook, Twitter, Youtube, and now Google Search. 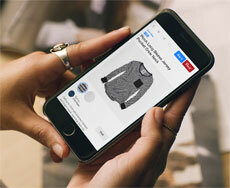 So what Pinterest’s move mean for the retail and ecommerce industry? Both Google and Pinterest will soon support transactions from your commerce system without the customer touching your storefront. You may think it a brash prediction that the online storefront is dying, but we see how merchandising beyond the storefront is becoming increasingly important. Content and commerce are converging, and it’s disrupting the traditional product page. As this trend continues, your brand, value propositions and site UX matter less. Your merchandising and social traction matter more. Channels are not so clear. Transactional capability will inevitably make its way to Instagram, Facebook, Twitter and whatever killer apps and experiences capture the hearts of consumers in the coming years. But to make transactions truly native to the experience versus simply linking back to an ecommerce storefront takes some deep API integration. Because of this integration requirement, Buyable Pins is not a feature that retailers can just turn-on like a Facebook store. It’s beyond hyperlinks and product feeds. It requires the social network’s API to play nicely with ecommerce platform APIs. Several ecommerce companies do have APIs that can integrate with Pinterest’s API and others, and will version their APIs to support multiple versions. But what happens down the road when multiple social, search and other third-party apps need to be integrated? An API for each of these touchpoints could create quite complex integration and maintenance requirements for IT. Integrating carts and order resources is the easy part. The hard part is evolving the API without breaking Pinterest, Facebook, Instagram, et cetera when you want to add new functionality, such as bundles, coupon codes, loyalty points or group buys. We tackle this via Hypermedia, where APIs and consuming applications are allowed to evolve independently. Hypermedia is based on the core tenets of the World Wide Web, where we assume data and capabilities are distributed. That’s what Pinterest also is based off, where a link from a website can create pins. We’re just now seeing the “reverse link” being put in place. With an API that embraces linking and distribution, we can take advantage of the expanding ecosystem of commerce without being buried in API and app maintenance hell. When a customer transacts with your ecommerce system through third parties, you’re a step removed from the experience. You likely can’t influence cross-sells, or otherwise personalize the sale, nor collect email and SMS opt-ins. You may not be able to promote your app download, Facebook Page or send follow up email. Your loyalty program may not extend into the experience. Ideally you want the ability to call this information back from third parties and integrate it with your single customer view or other analytics dashboards, power your personalization engines and automated marketing and remarketing programs and the like. Advanced commerce APIs make this possible, and bridge the gaps off-storefront touchpoints may create. For bricks-and-clicks retailers, connecting a customer’s offline and online touches and context is the Holy Omnichannel Grail. Digital drives in-store sales, but most commerce organizations and technologies are still too siloed to drink from that cup. 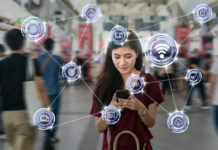 Forrester Analyst Adam Silverman believes the store of the future stands on the “platform-as-a-store,” where an API framework connects a centralized commerce “hub” to all systems and technologies. Imagine an omnichannel business that uses stores for fulfillment. A surge in Pinterest traction may cause sudden and unexpected demand for a single item. An integrated platform could be tuned to recognize such a spike as coming from a social source and throttle fulfillment evenly across stores to prevent stock-outs. eBusiness leaders who seek to rapidly deploy new digital store capabilities will require the agility to swap out modular components to create a retail store “ecosystem of value.” In order to achieve this state, the store must act as a platform, connecting functionality together with a common set of data. Pinterest is paving the way for many more off-site selling opportunities that, rather than merely redirect visitors to your e-store, actually facilitate a seamless shopping experience. To prepare your business to keep pace with the evolution of shopping, commerce platforms need to be equipped to extend beyond the dot-com site and support the blurring of “channels” – digital and physical.